Maximize your track performance with the SportMaxx Race. Derived from Dunlop Motorsports technology, the high grip racing compound gives you exceptional levels of road adherence and braking ability. This track optimised tyre is fully approved for road use. Enjoy precise steering response and consistent handling. The SportMaxx Race uses a hybrid overlay to limit tire distortion at high speeds, enhancing steering and stability. The tread features high angle ribs to increase lateral stiffness, for improved control when performing cornering manoeuvres. Massive outer shoulder blocks increase cornering grip. While optimised for dry, the SportMaxx Race performs well in wet conditions. 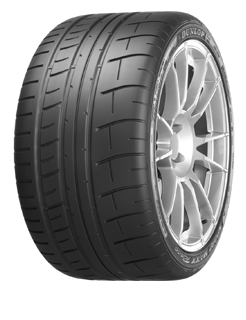 The asymmetric tread design features four inner grooves to quickly evacuate water, reducing the risk of aquaplaning.